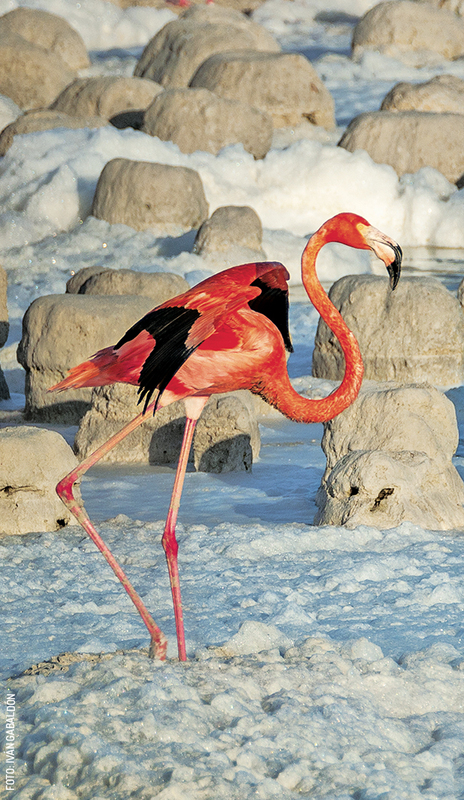 Tropically trending, pristinely pink, and curiously balanced, a large population of Caribbean Flamingos ranks high on a long list of “why visit Yucatán”. 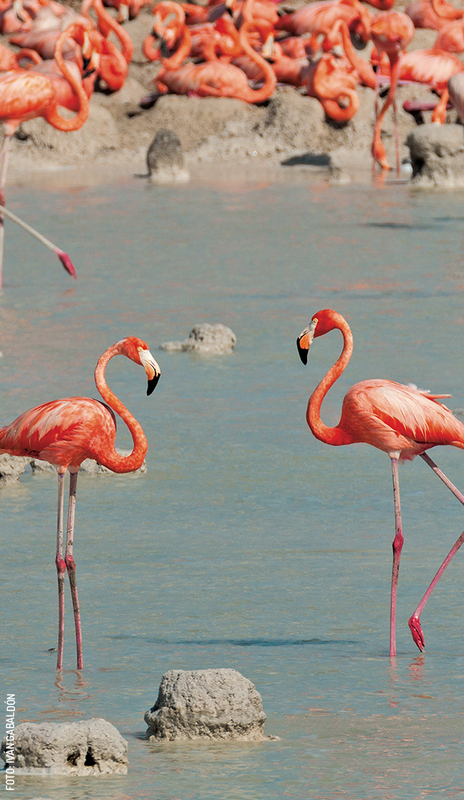 An extremely social bird, flamingos eat, rest, and fly in large groups, setting the stage for breathtaking views along Yucatán’s coastal highways. Catch them feeding alongside the old highway out to Chuburná, mating in Celestún in the spring, relaxing on the road between Chabihau and Santa Clara, and flying above the lookout ramps at the entrance to Sisal, where hundreds of wide-winged flamingos sail through the air, silhouetted by the orange-pink sunset. Mainly a monogamous species, flamingos are historically famous for their flamboyant mating dance – “flamenco.” When two flamingos flirt, their long legs skate across the water, wings perked, pink curves with black tips. They move back and forth in a synchronized rhythm, until the female makes a decision: accepting and transitioning to the mating posture or twirling back into the crowd, stopping the game. Wildlife photographer Iván Gabaldón explains, “Flamingos are individuals. They have a variety of relationships: long-term couples or groups of three or four.” During the summer nesting season, the family units integrate into the larger flamingo community, gathering together by the thousands in the Reserva de la Biósfera Río Lagartos to bring their babies to life. In 2016, Iván woke up for five days straight at 3 am for the rare opportunity of photographing the nesting flamingos. Access to the nesting areas is extremely protected, reserved for scientists and researchers with specific missions. Iván describes the nesting period, emphasizing that flamingo behavior becomes extremely protective and serious, the colony noisy with action. The birds constantly send out alerts, as they each take part in preparing the tedious, volcano-shaped nests. Using their feet, the flamingo slaps and shapes the gray mud as a part of the nest’s constant maintenance procedure, like a potter throwing a wide-based, shallow bowl. Our cover photo of the adult bird tending the egg in its nest is one of Iván’s unforgettable shots from that photo session. Once the single egg is laid, it hatches in about a month, revealing a fuzzy little gray baby bird, who looks foreign alongside its neon-pink parents. Over the next couple of years, the babies will pinken as they move their downward curved beaks through Yucatán’s muddy white wetlands and salt-flats, filtering the water for foods containing an organic pigment called carotenoid. Happy flamingos have their heads under water, doing the important work of snacking. When flamingos are unhappy, they throw their heads up and prance, shaking their wings, honking out in their goose-like call. While traveling in Yucatán, pay attention to their signals, because the consequences of getting too close to flamingos can be very detrimental to the birds, causing spontaneous flight, disrupting eating patterns, and burning precious energy and the daylight needed for feeding. Please note: this is nature, and we cannot promise when you will see the most flamingos and where.